Behold, the brand new Nissan Juke making its stateside debut this year. And what a debut it is. Designed in Europe with finishing touches from Japan, the Juke is an attention-grabbing mashup of parts, from its reptilian rally car-inspired hood lamps, motorcycle-like center console and a back-end that looks ripped directly from a 370Z. This more compact crossover is Nissan’s effort to snag the young-ish male demographic that has wrinkled its nose at the more popular-with-the-ladies Rogue. The vehicle has already sold well in overseas markets and is somewhat of an experiment for Nissan, filling in somewhere among the Versa, Cube and Rogue. With 180-plus horses under the hood, plenty of nifty optional features and a sticker price in the low-to-mid-$20K range, it’s sure to attract the younger, aesthetically focused 18-to 34-year-old market. 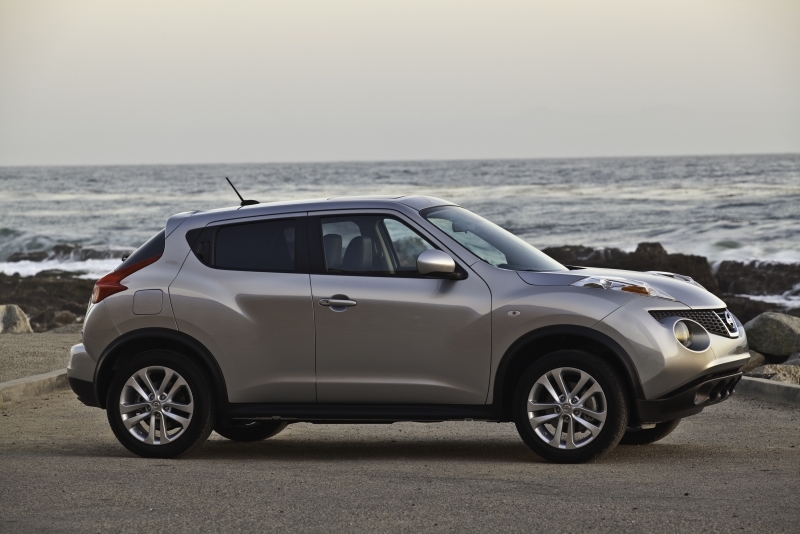 The Juke offers the curvaceous beauty and power of a sports car with the utility of an SUV, but without an unreasonable price tag. Folding 60/40 split rear seats allow for added cargo room and electric steering, six airbags, 17-inch alloy wheels and stability and traction control systems all come standard. 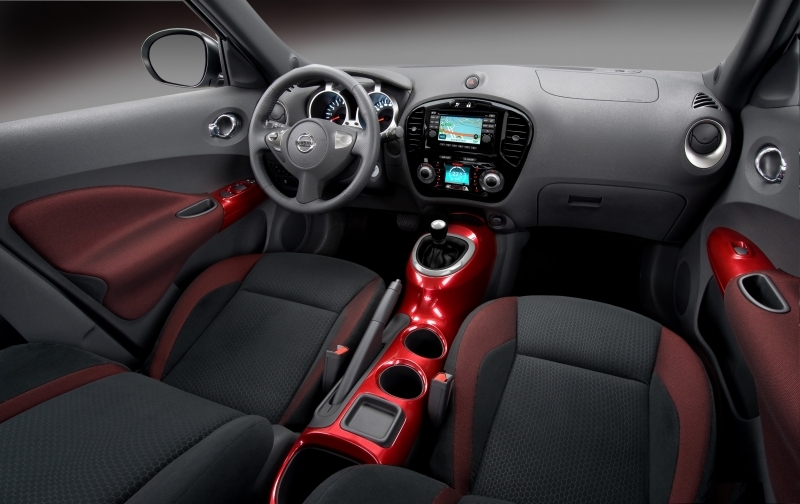 The Juke has plenty of options for drivers who want to customize their ride, including push-button ignition, rear-view camera and heated leather seats. More noticeable on the manual transmission than the automatic is an audible whine caused by the continuously variable transmission (CVT), which became irksome when shifting up and down in traffic or on windy roads. The back seat was snug even for a modestly sized person, and the sloping rear-end makes it quite uncomfortable to cart around anyone over six-feet tall. Cargo space with rear seats erect measures noticeably less than the Versa with only 10.5 cubic feet of cargo space versus 35.9 cubic feet when they're folded down. The Juke knows how to handle a turn, and both the all-wheel and front-wheel drive versions stick to the asphalt surprisingly well for a vehicle with a higher center of gravity. The torque vectoring system is noticeable and allows for a much more confident ride on winding mountain roads or when heading into curves. The I-CON interface toggles between Normal, Sport and Eco modes; the latter has a definitively more sluggish feel, while the Sport mode is a barely noticeable change from Normal. The ride is comfortable enough, but between the CVT system and 99.6-inch wheelbase, you’re in for a less-than-quiet ride. The Juke offers a sturdy 1.6-liter direct inject turbocharged four-cylinder engine that boasts 188 horsepower and 177 lb-ft of torque. This feisty little ute comes standard with a continuously variable automatic transmission or an optional six-speed manual transmission (in front-wheel drive SV or SL trim levels). All-wheel drive versions come with a torque vectoring system that shifts weight between both the front and back wheels and from left to right. This is the first B-segment vehicle to offer this technology, and Nissan claims that its 65-pound system is the lightest on the market. 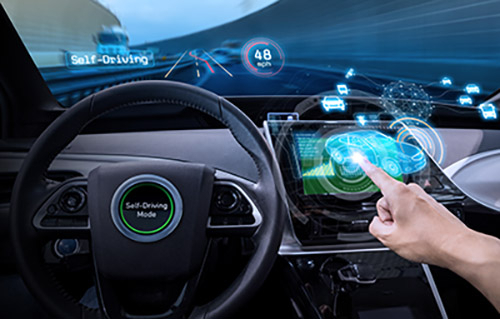 Drivers who like to keep an eye on how their vehicle is performing will get a kick out of the new integrated control interface, (I-CON) which allows the driver to keep track of the vehicle’s torque and driving modes. Though their oversimplified design comes off as slightly gimmicky, it’s still an interesting feature not seen in any other car in its class. For an additional $800, the navigation package includes upgraded speakers and an 8-inch Rockford Fosgate subwoofer. The S, SV and SL level Jukes come standard with a six-speaker audio system and an iPod interface. 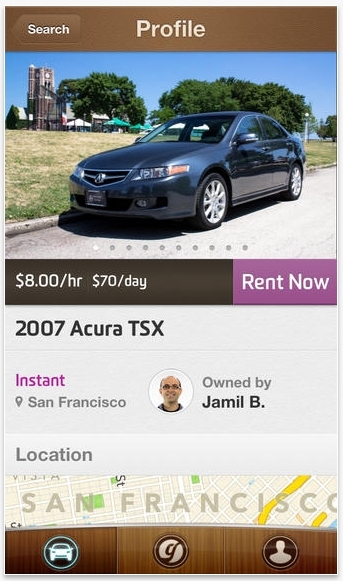 Optional keyless entry and push button ignition are worth the extra dough, and read-view cameras, satellite radio, heated front seats, Bluetooth and GPS navigation system round out the tech savvy fully loaded version. 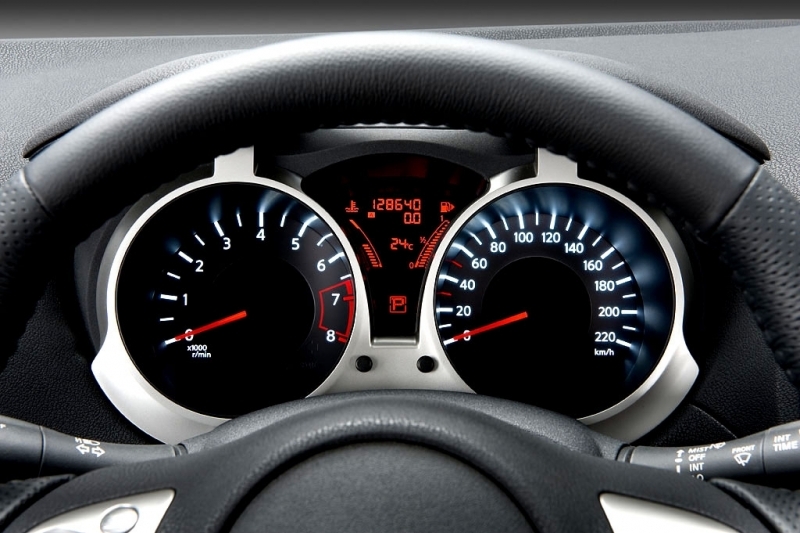 Unlike the Rogue, the Juke allows for operation in Normal, Eco and Sport modes, which vary throttle control and responsiveness to either conserve energy or give you an extra boost on the road. 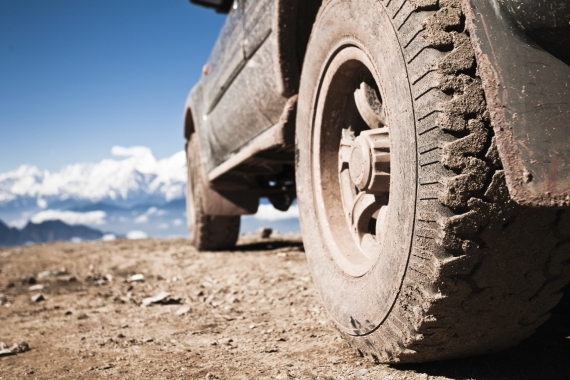 Nissan estimates fuel economy to hit around the generous 30 mpg mark. Not bad for its size, but keep in mind that that number could vary greatly with added cargo or switching between driving modes. Splashes of red accent the aggressive interior of the vehicle, with the motorcycle fuel tank center console adding another hint of masculinity. The gearshift resembles that of a much smaller, sportier car and some trims offer two-toned bolstered bucket seats for an added flash of interior color. The I-CON interface is a digital do-it-all center with controls for everything from drive mode to what’s playing on your iPod. 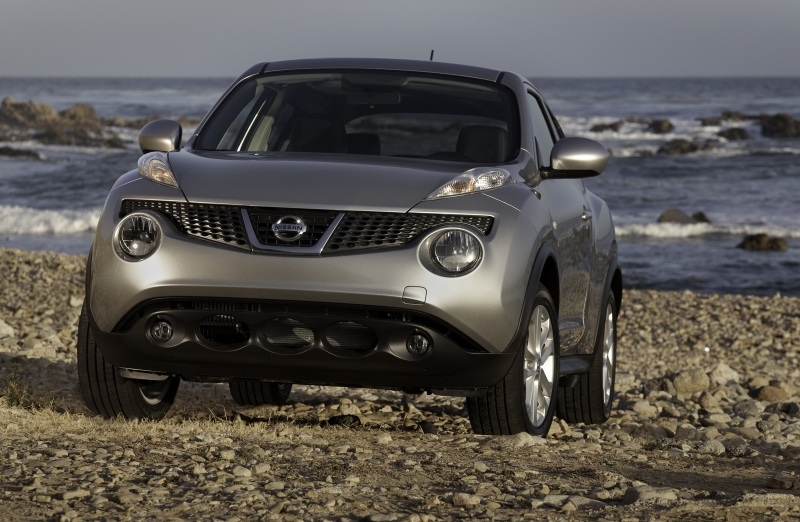 There’s nothing on the road right now that looks quite like the Juke. Nissan calls the design “robobiotic,â€ or a fusion between organic and mechanical forms. For example, the bulbous hood lamps are thought to evoke the peering eyes of a crocodile, and the front grille forms a honeycomb shape. Taillights borrowed from the sporty 370Z make for a back-end that resembles a smaller, zippier hatchback coupe. The Juke is the Versa’s fancier older brother, coming in at double the base price of a sedan and a few thousand more than the 1.8 SL Versa. The lower end S model is expected to sell with an MSRP from $18,960 to $20,460, while the SV and SL models range from $20,260 to 22,260 and $22,550 to $24,559 respectively, depending on optional features. With technology features that out-pace the rest of the class and unique exterior design, we have no doubt that the Juke will attract the type of buyer Nissan is hoping to grab. It does have the unfortunate placement of being sized directly in competition with some of its brethren though, and styling could be a tad too much for many drivers to handle. 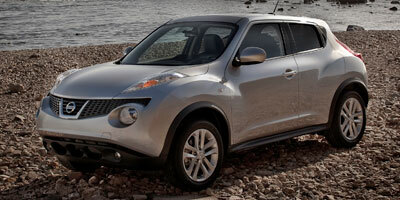 Still, we love seeing something a little crazy on the market, and the Juke definitely ups the ante.